Other than leopard, stripes are probably the only other pattern I wear. Black and white (or beige) stripes are my favorite. They are classic and pair well with brown. You can also add a pop of color with red. I have recently been doing a lot of browsing and shopping at H&M. They have great prices. This striped dress that I found is only $13. It would be perfect for spring layered with a denim jacket or worn on its own in the summer with these platform sandals. Today, I am excited to announce a new blogging series that is starting today called - BLOGGING TIPS. I have paired up with 5 other blogs (Peaches in a Pod, Sweaters, Stripes & Sweets, Shoes to Shiraz, Doused in Pink, Pumps and Push Ups). Each week, we will be sharing our tips on everything from starting a blog, to working with brands and where to go for help. This week we are talking about what we wish we had known before we started a blog. Also, our blogging series will be set up as a "Blog Hop"- so at the end of my post, I will link to the next blogger - be sure to hop over to her blog, and then, hop around until you have visited all six of us. There are many things I wish I had known before starting a blog. I think that is the case with many things - once we have done something - we have the insight needed to make more informed decisions the next time. In reflecting back over the four years that I have had my blog - the one thing that stands out that I wish I would have known when I started is the importance of building a community. Both the external (those that follow you) and internal (your fellow bloggers) community. Both are extremely important. When I started my blog - I did not put enough thought in to either. I was focused mainly on the content I created. I kind of had the Field of Dreams philosophy - If you build it they will come. Well, after having my blog for four years, I can tell you - that is not the case. You have to WORK at building your communities. Building an external community is one of the hardest things I have encountered with this blog. As a blogger, I am competing with more established blogs and many, many, many, many blogs - and new ones starting each day. One thing I am still working through is finding my “unique” voice - that will draw people to my blog over others. My recommendation is to spend time figuring out what makes your blog different from all the others that already exist. Once you have established that - find ways to market your blog - and bring-in your followers. In thinking about that, you may want to check out this post on 10 ways to market your new blog. As far as an internal community, in the first couple of years of having my blog, I stayed pretty isolated to myself. I did not reach out to other bloggers. In the last year or so, I have made an effort and have invested time in getting to know fellow bloggers. I have gotten past my fear and have reached out to other bloggers for different collaborative projects, like this one. I joined a collaborative group of bloggers, and we formed The Blended Blog. It is so important to get to know fellow bloggers. They will be the help and support you need at different times. I have found fellow bloggers to be very open to helping one another. Even though we are all trying to build our "own brand" - we all want to support each other. Also, through connecting with fellow bloggers, it will help build and market your brand. Fellow bloggers will become familiar with you - and in turn when they have a project - they may think of you - and reach out to you. So, when starting a blog - invest time getting to know others. Some of them will become good friends, mentors, and most importantly, the boost you need on days when you wonder what you are doing! Check back next Tuesday - when we share our thoughts on Wordpress and Blogger. Now, be sure to "hop" over to Marta at Sweaters, Stripes & Sweets to read about what she wish she knew before starting her blog. Such great advice! The blogger community is so much fun and we love working together on things like this! Thanks! I am enjoying working with you, too! I am so happy to be one of the people who is gotten to know you, you are so right on these points..having your people is so important! I am so happy to have gotten to know you, too! Great outfit set and great blogging tips, Lisa! I enjoyed reading your thoughts on community building and I agree. Having blogger friends is a great way to learn and grow your site! It also makes the (often frustrating) blogging process much more enjoyable. I also agree with your comment that "if you build it, they will come" is NOT true when it comes to blogging. If you build it, it will sit there all by itself until you put in a LOT of legwork to get the word out to people that your blog exists! I am with you on the (often frustrating) blogging process. Thank you for your support over this last year. I love these tips Lisa! Great post Lisa, I'm excited to read the article you linked to about marketing your blog so thanks for sharing! Building an external community is certainly a challenge with so much competition out there but like you said finding your own voice and also loving what you do will make a difference. Thanks very much for organizing this great series & inviting me to participate! Thanks Marta for joining in - can't wait until next week! Yes! I didn't think about building a community when I started but these relationships have grown to be the most important part of blogging to me! The friendships are one of my most treasured parts of blogging. 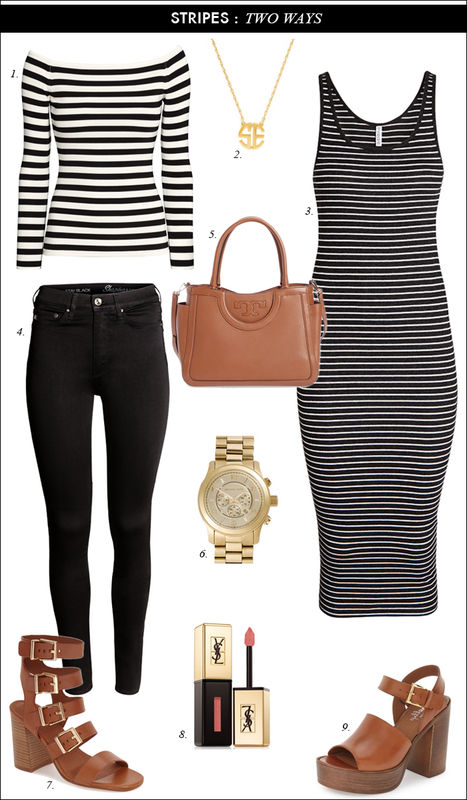 Give me allll the stripes- love that body con dress! I love that dress, too - it is in my cart! Great advice Lisa. Building community is so important - and I'm so happy to be part of yours on The Blended Blog! Thanks, Lana! So happy to be a part of The Blended Blog with you, too. I couldn't agree more. You're right on the blogging tips. Great picks of ensemble. I'm a sucker for stripes. Its timeless! So very true! Building relationships with other bloggers can help you grow your blog in a multitude of ways-through their advice, through collaborations, and by linking to each other! It is so true - and they are what get me through rough days blogging. Thanks, Laura! Nice outfit collection. love this outfit. Relationships and collaboration are so important. I agree. And I'm loving these stripes! Building a community is key! The most rewarding thing about blogging is the connections I've made! Omg love the stripes and I love all of these tips! I am a big sucker for stripes! 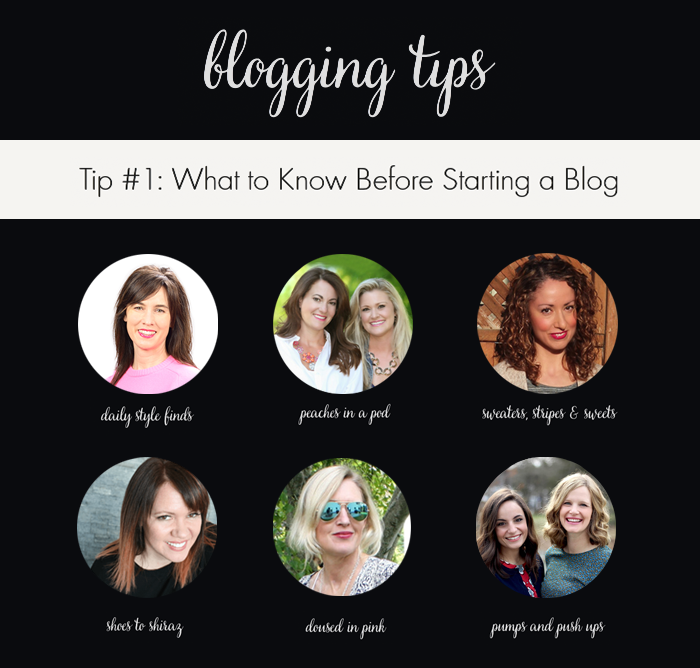 And such great tips for starting a blog, or even trying to expand your blog! I need to follow everyones advice, they did so great, can't wait for the next topic! Next Tuesday? Amen to community! Glad you are part of mine! :) I look forward to all the new things I'm going to learn! I love your tips! I've wanted a striped maxi dress for so long. This is a staple piece! Such a great blog hop! Great tips! It's so easy to focus mainly on content creation but connecting with others is so important! Amazing advice! Seriously! Blogging is a lot of work and I need to be better about connecting with other bloggers IRL!!! Easier said than done but I appreciate the great articles and tips you provided! Pinned this post and good advice. So blessed to be among the great gals of TBB. And those stripes are super sassy.